CSV2OFX is a conversion solution that converts CSV to OFX and imports into MS Money, Sage One, Xero, YNAB, AccountEdge. Work for CSV2OFX (CSV to OFX Converter)? "Tough to find a tool that beats this almost extinct file format!" Simply enough, this software makes the conversions needed to analyze a couple of our clients that need the uncommon .OFX format. Commonly confused with Quickbooks .QFX file, the search for compatible software is a pain! Support is ready to handle any questions you may have with set up and conversion, along with a nice written tutorial and YouTube video for those that don't like to read! Not much to dislike. The UI is basic, nothing pretty at all but I wouldn't consider that an actual flaw. Functionality is key here. File conversions can be tricky and become corrupt if attempting to try your own. For $40 this is a great buy, and will save you if working with .OFX files often. We can email (and also fax) the financial documents our clients need right to them, readily compatible with the systems they have in place, with no headache at our end! "CSV2OFX (CSV to OFX Converter)"
Mapping function is a bit complicated for first time setting up, and it is not a visualize mapping tool. Sometimes this causes mapping errors since we are not able to pick the correct path. When I was using the converter, sometimes I was not able to figure out the final format data will be credits or debits, until the conversion is completed. It will be better if the mapping screen has a split vision, so user can drag the fields for matching. Also, a preview screen with the converted file is very helpful. Moreover, if more formats it can convert, will be great! We are able to utilize the CSV file after conversion since our cloudbase accounting system only accept certain formats for uploads and many other functions. And if a template has been setup and used once, you can find it from your history list easily, so it saves time when you need to use the same setting again and again. In addition, customization is easy for template setting, and you can change anytime once you find out a modification is needed. What File Converter solution do you use? This software allows our company to enter data without having any errors, making any kind of accounting manageable. This software is easy to use by accessing it directly from Excel where all your accounting format sheets are made. also love how there is a support system to contact if you are having problems. That this software is only a free trial! You will be asked to purchase if you wish to continue which sometimes is not always the best of a company if every person needs to purchase a software. worth the trial but not sure if its worth the purchase as there are many software programs like this one out there for free. Putting all our accountings in order which minus the chances of error entered. "Lifesaver for Accountants and Bookkeepers"
This program has made my life so much easier when helping my clients that use a specific accounting program that has issues reading csv files but imports OFX like a dream. I can quickly convert using this program and not have to wrestle with bank statment imports anymore. Not the most beautiful interface, but it does the job which is more important. Skip the "free" options online and just buy this program. I need to convert CSV bank statements to be able to import into accounting software that reads OFX. "This converter worked perfectly for me"
It's super easy to use. The installation is simple and file worked great for the conversion. its good to have a knowledge of which fields need to be filled in if you're planning on using it extensively. The price isn't too bad, especially if you're looking to use it more than once. There's a free trial that lets you use it before you buy it. It helped us solve an issue for one of clients. When you deal with different banks and financial software then these types of converters are needed at some point in time. It saved us a lot of time without manually having to do all the work. The best feature is that this is available for Macs. I can use my mac and anaconda for this. It is still very blank and lot of prework needs to be done before you can finally get your OFX file. We are using invoice acuration with this. We are fetting data in all form of unstructured way. While there are vendors which help in OFX conversion, but this tool we are doing it in house now. Was easy to convert bank files to the file type I needed. There is nothing I found in the program that I disliked. I convert bank files that come through as CSV files to OFX so that they can be loaded into my accounting program without me having to manually input the files. Easy to use, works great! Simple instructions. Nothing - it is a great app. Anyone can use this. This app allows you to continue to use outdated software (like Microsoft Money) and others. It keeps you from having to re-enter data that should be easy to upload. "Use it privately to bring bank account data to accounting software." Easy to use, does what it is expected to do without fancy but useless functions. Haven't got to save templates so I don't need to do all settings again every time. Use it privately to bring bank account data to accounting software. 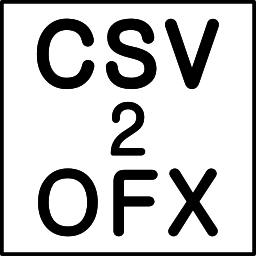 Learning about CSV2OFX (CSV to OFX Converter)? * We monitor all CSV2OFX (CSV to OFX Converter) reviews to prevent fraudulent reviews and keep review quality high. We do not post reviews by company employees or direct competitors. Validated reviews require the user to submit a screenshot of the product containing their user ID, in order to verify a user is an actual user of the product. Hi there! Are you looking to implement a solution like CSV2OFX?